It's hard to believe that Frozen debuted four years ago, today! Since its debut almost four years ago, Frozen has become ubiquitous at Walt Disney World Resort. If you still can’t Let It Go, here’s where you can meet your favorite citizens of Arendelle at Walt Disney World. Note: Anna and Elsa used to meet at Princess Fairytale Hall in Fantasyland, but they no longer meet there. · Mickey’s Royal Friendship Faire Castle Stage Show -In this recent addition to Magic Kingdom, Anna, Elsa, and Olaf join forces with tons of Disney characters to celebrate friendship. While I’ll always have a soft spot for Dream Along with Mickey, this show is also a lot of fun. It features characters from The Princess and the Frog, Tangled, and Frozen interacting with classic Disney characters. Plus, the signature song is super catchy! · Festival of Fantasy Parade -This parade is one of my favorites that Disney has created. Anna, Elsa, and an animatronic Olaf are on the back of the first float on this parade. They share this float with several other Disney princesses and their princes: Belle and Beast, Cinderella and Prince Charming, Princess Tiana and Prince Naveen. · Once Upon a Time -This projection show on Cinderella Castle features Mrs. Potts telling Chip a slew of bedtime stories. Once of these stories is the tale of the two sisters from Frozen. The projection sequences for “For the First Time in Forever” and “Let It Go” are phenomenal. This show is one not to be missed, even if you aren’t that big of a Frozen fan. · Happily Ever After -Olaf is included in some of the projections on the Castle. Love is an Open Door is featured in one of the montages. For better or for worse, Anna and Elsa and all their Frozen friends have a strong presence at this park. 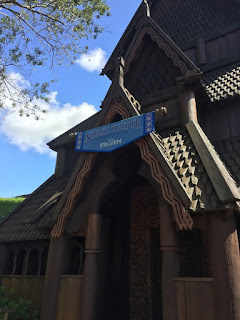 The Norway pavilion in Epcot’s World Showcase has experienced a Frozen takeover in recent years. 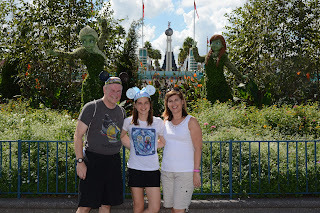 · Frozen Ever After -Rope drop at Epcot has become what I like to call the “running of the dads.” In the past, families would make a break for Test Track or Soarin’. While Epcot is huge, both of these attractions are located in Future World, closer to the park’s main entrance. When Frozen Ever After replaced Norway’s Maelstrom in 2016, families faced a dilemma. All three attractions are Tier One Fastpass Plus rides. This means you can only obtain a FPP for one of these attractions. Difficult choices must be made. Many families have opted to hit Frozen at rope drop. This means a long run-walk to World Showcase, much further than either Future World attraction. If you’re at Epcot at park open, you’re bound to see a bunch of dads with daughters in strollers, dressed in full Anna or Elsa regalia make the mad dash to Frozen Ever After. In my opinion, the attraction is well done. It utilizes the existing track from Norway’s prior attraction, Maelstrom. The Audio-Animatronics on this attraction are next-generation and compare with the dwarves on Seven Dwarves Mine Train. The ice palace sequence where Elsa belts out “Let It Go” is absolutely stunning and the highlight of this attraction. Keep in mind that this attraction features short flumes (similar to Pirates of the Caribbean) and does travel backwards. · Meet Anna and Elsa at Royal Sommerhaus -As I mentioned earlier in this post, Anna and Elsa used to meet and greet at Princess Fairytale Hall in Fantasyland in Magic Kingdom. When the Norway pavilion was reimagined as Arendelle, their meet and greet location moved to Epcot. Here you can meet with each of the sisters in their Royal Sommerhaus. Photopass photographers are on hand to capture your moment with royalty. Disney’s Hollywood Studios was one of the first parks to include Frozen in its offerings and these beloved characters still have a presence here. · For the First Time in Forever: A Frozen Sing a Long Celebration -I’ll confess, I put off seeing this show for at least a year. How good could a “sing-a-long” show really be? Finally, last November, Nicole and I made time for this attraction. I was surprised at how much I enjoyed it. With its presence everywhere, I forgot just how good the music of Frozen really is. This show is a lot of fun. I now include it in my Disney’s Hollywood Studios touring plan. · Meet Olaf at Celebrity Spotlight – Located in the Echo Lake section of the park, this is a meet and greet with everyone’s favorite snowman: Olaf. He loves warm hugs! Again, Disney’s Photopass photographers are on hand to capture the magical moment. Elsewhere at Walt Disney World Resort, Frozen merchandise can be found in many gift shops. If you have young princesses in your travel party, both Anna and Elsa are available for their princess transformation at the Bibbidi-Boppidi-Boutique. What’s your favorite place to find Frozen?